Okay, so now I need to untangle the mess I made with the tiles and walls in the previous post. First, I’m getting rid of the “features” that I don’t want and need to redo differently. And then reimplementing the walls and doors doing their sprite visuals properly. And that about reverts half the work I did before in about half the time. And that works fine, except the player can move way too far”below” the wall top, because it’s technically a free tile. This looks believable enough that I will go with it. And I’m definitely not redoing any collision or rendering logic at the moment. And that makes the doors. Unfortunately, I would need to dynamically update the wall top individual corner sprite visibility and I won’t be doing that. I think this about wraps up my immediate wall and door sprite requirements. 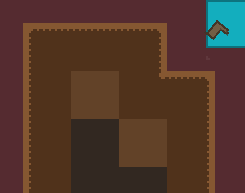 I also though about destructible tiles and how to make them and it all boils down to needing way more art before I even get into coding all the cases of destroyed walls. In short, I am not going to do this. So my filler and bedrock tiles aren’t needed anymore. Yikes! That’s actually a lot looking at them like that compared to the previous “floor, wall, door”. Of course, these are ready to be “arted” and it also could have been a lot more if I wasn’t designing them properly, that is, minimizing the needed assets and programmatically arranging them. And I think that about does it for this “feature”. There’s a bunch of other fixes and tweaks I did in parallel that I haven’t mentioned. I already spent way too long on this and I need to work on something else before I go mad.